The novel takes place during and after the death of Abraham Lincoln's son William "Willie" Wallace Lincoln and deals with the president's grief at his loss. The bulk of the novel, which takes place over the course of a single evening, is set in the bardo—an intermediate space after death. Previously on the blue... the audiobook production of this novel is astounding, with 166 voice actors. This was so very, very good. I can't tell you how much I wanted my pick for the best book of the year not to be by an accomplished acclaimed academic white man. But it's really something special: chock full of memorable characters treated with real empathy, daring in its form, fluid in its prose, and memorable in its philosophy. I listened to the much-heralded audiobook version of this and am glad that I did, as it is truly a wonder to experience. I haven't read it yet, but I wanted to comment to say that you are killing it with the book recs recently. I greatly appreciate it. I heartily agree that the audio book version of this is a wonder. Listening to the voices of really impressive actors describe Lincoln visiting his son in the crypt and holding him wrecked me. The tension of souls waiting to be weighed on their way into heaven has stuck with me, now, for months afterward. I'm not sure I could have made it through this book in regular print form, and I definitely would have skipped some footnotes. The more I think about this book, the more I think about its recurring theme that very few of us can offer a truly clear accounting of our lives. We're all kidding ourselves about the severity of our failings and somehow selling short the good that is on the other side of the ledger at the same time. One of the things I truly enjoyed was how it managed to find give glimpses of an enormous, unknowable, complex vision of what happens to people after death with such detail and resonance that they felt like part of a bigger truth than we could ever know. It was such that the felt recognizable on some primal level while still being incomprehensible, whihc just seemed right. I apologize for bringing in a low culture point of comparison here, but the UK tv show Being Human had a marvelous little touch in its handling of the bridge between life and death that gave me the same feeling: "the men with sticks and ropes" who chase people who are in the in-between. Like LitB, it's an image that is both unique and inexplicable but still somehow resonant in the emotional response it provokes in us and how it echoes some of the tonal aspects of various religious/spiritual/supernatural tropes. Just finished this, and really enjoyed it, and the audiobook reading. David Sedaris was really quite moving. My only question is which of the historical reference material quotes were real and which were fiction. Has anyone found a list separating them out? 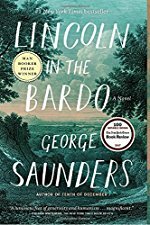 "Most of these references are real, from the many books on Lincoln’s life and times that Saunders consulted; some are made up. “I loved the idea of the reader and writer playing this elaborate game,” he said. “I’m inventing these sources, but maybe you don’t know it."